How long do you want to wait before starting your new career? 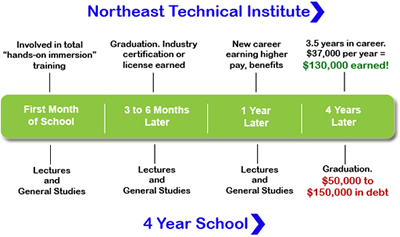 The average career training program at NTI is 16.6 weeks in length. This time line shows how fast you can achieve your career goals compared to a four year school. Just one year from high school graduation (or from your previous job), you could be well established in your new career while your peers are still sitting in lectures and three years away from graduating school.